The word of Tanah Lot is consisted of two words that are Tanah word interpreted as a reef looking like gili or isle. Lot or Lod word has meaning the ocean. 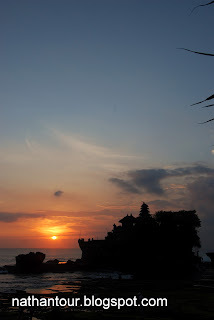 So Tanah Lot is meaning the small island floating on the ocean. The location is now called as Tanah Lot has been used at a Megalithic period as a place that looked into holy, proven from the existence of menhir. Pursuant to environmental condition, hence the structure of Tanah Lot Temple is built at irregular reef plain of its angle which is only consisted of one plain yard as Jeroan. Tanah Lot Temple as dang Kahyangan (the big Holy Temples in Bali ), because the history and the Penyiwi (The people taking care of the temple) are from the local people from Tabanan regency and surrounding area.